Gibson has revealed the catchily-titled Tak Matsumoto Doublecut Custom Ebony, a bells and whistles variation of the japanese guitarist's favoured double-cutaway model with a number of luxurious twists. You may not know who he is, but Tak is massive news in Asia, thanks to his time with 80-million-selling hard rock duo B'z and his subsequent solo carrer. He's beginning to make waves in America too and, as such, has now received no less than seven Gibson and Epiphone signature guitars. The Doublecut Custom Ebony is essentially an 'all-frills' Custom-treament overhaul, featuring his preferred Gibson Burstbucker #2 and #3 pickups and offset double-cutaway mahogany body, but with a number of dressy cosmetic features. 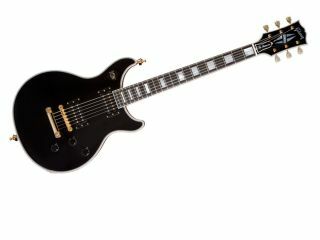 Most noticeable is the flashy gold-plated hardware, particularly on the ABR bridge and stop bar tail piece, plus the mother-of-pearl inlays and signature Gibson Custom split diamond logo on the headstock, but the guitar also comes with Schaller strap locks and has been hand-finished in nitrocellulose gloss, beloved by gear-heads. Controls are much the same, as Tak's previous signature Gibsons - a three-way toggle switch, two volume controls and a master tone pot - but might suit those looking for a simpler set-up. The Gibson Tak Matsumoto Doublecut Custom Ebony has a US MSRP of $5,762 (approx. £3,674), but there's no word on UK availability yet.